This is an example in which a teacher faces some obstacles to the reuse of open content. To face it effectively, he will need to implement some strategies for adapting the open content. That is, he will have to localise OER. In this case, he will have to translate the content and introduce examples related to the local economy, as well as incorporate it officially into the curriculum and syllabus of his course at the university. 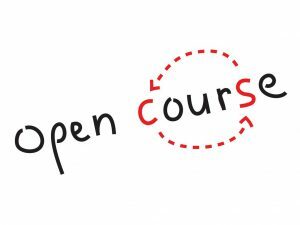 In this lesson, we first present the barriers to reuse of open contents. 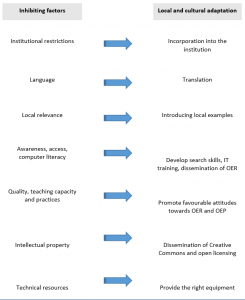 Second, some of the strategies for local and cultural adaptation of OER are examined. Hatakka (2009) has reviewed some of the most common obstacles in the reuse of open content in developing countries. We have summarised it in the Table ‘11 factors that inhibit the reuse of open contents’. Along with the original list of 11 factors, we have provided a brief description of each barrier. Educational rules and restrictions Depending on each institutional context, the Ministry of Education or the university itself can decide which types of educational materials are used in class, or what language can be used in the teaching practice. The rules set limit the type of contents that can be included in the curriculum or syllabus. Language Much of the open content is only in English. The need to translate – or even the peculiarities of the language used or its cultural references – may become an obstacle to its use. Quality The more (or less) trust the potential users can have in the contents can determine their use. Intellectual property Clarity regarding copyright and the type of uses that each content allows, are relevant to reuse by third parties. Computer literacy IT literacy influences the teacher’s ability to incorporate OER into their teaching. Reuse of open content is not easy or immediate. It requires a significant investment of time and effort. To be effective it has to be made relevant in the local context. Following the 11 previous factors, next we propose some of the strategies that facilitate the local and cultural adaptation of open contents. They are summarised in Box 5.1. 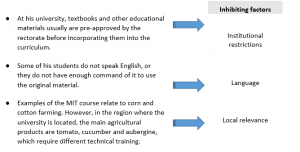 The local adaptation of OER has as prerequisites (a) the existence of appropriate technological equipment, together with the (b) attitudes, (c) knowledge and (d) skills needed by teachers to incorporate them in their teaching practice. Therefore, community readiness to adopt OER consists of both needed technology and digital skills of teachers. This is a case of teacher-student interaction that seems conditioned by some elements of cultural distance. Traditionally, it is a very common situation in academic exchange programmes or in development cooperation projects. It can also arise in internet-mediated communication, often involving international or intercultural interactions. To examine international contact situations, one of the most widely used models consists of the application of the five dimensions of cultural variability (Hofstede, 1980). In the following table, we have compiled the original definitions by Geert Hofstede. Power distance This dimension expresses the degree to which the less powerful members of a society accept and expect that power is distributed unequally. The fundamental issue here is how a society handles inequalities among people. People in societies exhibiting a large degree of Power Distance accept a hierarchical order in which everybody has a place and which needs no further justification. In societies with low Power Distance, people strive to equalise the distribution of power and demand justification for inequalities of power. Femininity-Masculinity The masculinity side of this dimension represents a preference in society for achievement, heroism, assertiveness and material rewards for success. Society at large is more competitive. Its opposite, femininity, stands for a preference for cooperation, modesty, caring for the weak and quality of life. Society at large is more consensus-oriented. In the business context Masculinity versus Femininity is sometimes also related to as ‘tough versus tender’ cultures. Uncertainty Avoidance The Uncertainty Avoidance dimension expresses the degree to which the members of a society feel uncomfortable with uncertainty and ambiguity. The fundamental issue here is how a society deals with the fact that the future can never be known: should we try to control the future or just let it happen? Countries exhibiting strong UAI maintain rigid codes of belief and behaviour and are intolerant of unorthodox behaviour and ideas. Weak UAI societies maintain a more relaxed attitude in which practice counts more than principles. Long-term versus short-term orientation Every society has to maintain some links with its own past while dealing with the challenges of the present and the future. Societies prioritise these two existential goals differently. Societies who score low on this dimension, for example, prefer to maintain time-honoured traditions and norms while viewing societal change with suspicion. Those with a culture which scores high, on the other hand, take a more pragmatic approach: they encourage thrift and efforts in modern education as a way to prepare for the future. 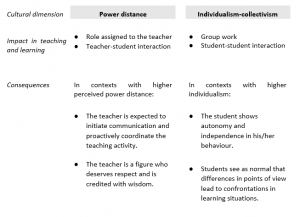 In situations of intercultural contact, these dimensions may affect the teacher-student or the student-student interaction. For example, distance to authority influences the role assigned to the teacher, and the degree of individualism affects the type of interactions that occur within groups of students. Research has shown that in developed countries it is comparatively more frequent to find individualistic values and a more egalitarian relationship style. In traditional cultures of developing countries, collectivist values and a perception of greater distance from authority figures are comparatively more common. In the case of intercultural contact, frictions occur which need to be handled properly. 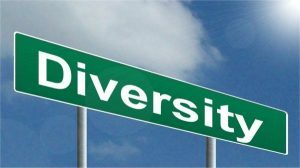 For this reason, it is important to be aware of the elements of cultural distance and to face them effectively.